It's been hot and humid here this past week. 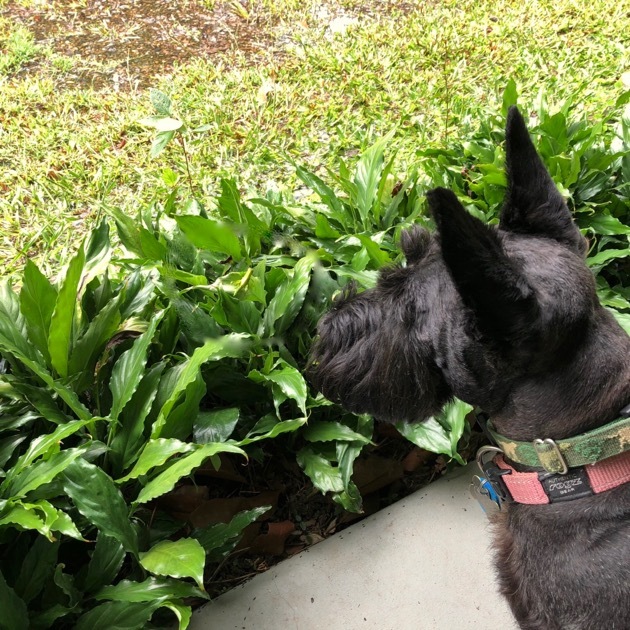 Most days, Hanno and I both took advantage of the cooler temperatures before 8am and did a few bits and pieces in the garden and front verandah. Hanno is continuing with general tidying up as well as lawn mowing on the ride-on, and I've been cleaning and organising the bush house, planting up the first of the polystyrene boxes and sowing seeds. It's hot work but it needs to be done so we work until we get hot and then go inside, put the air-conditioner on and have a cold drink. And there we stay, working on inside jobs, until about 4ish when the temperature starts to slowly descend. 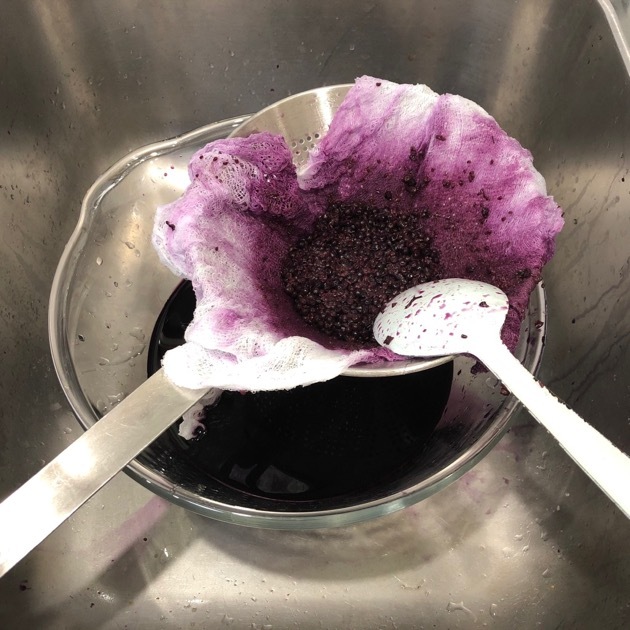 Hanno making up a cold elderberry cordial. You might be able to see the grasshopper Gracie is looking at. She was locked in on it and when it hopped away, she lost it! We have plenty to do inside and I'm ever grateful we can work in a cool house. We set the aircon to 26 with the fan on two bars. That cools the area we're working in, without using too much electricity. Our bills during the year average out to something we can afford and our power bills tell us that we two people with frequent visitors, use the same power as one person. And we don't feel deprived, we both use whatever appliances we need to use but we always turn off lights and equipment when we're not using them. It's easy for us because we're in the habit of living like this and when we only have to pay $70 - $100 or so each bill when people we know are paying multi-hundreds, it confirms that we should keep doing what we're doing. Just between you and me, it's a very easy habit to develop. I always strain the berries using cheesecloth. It's the only thing that removes all the tiny bits of twig that are sometimes left in the mix. My inside work over the past week has been focused on the blogging and writing courses I'm starting soon as well as processing fruit for drinks and jam. 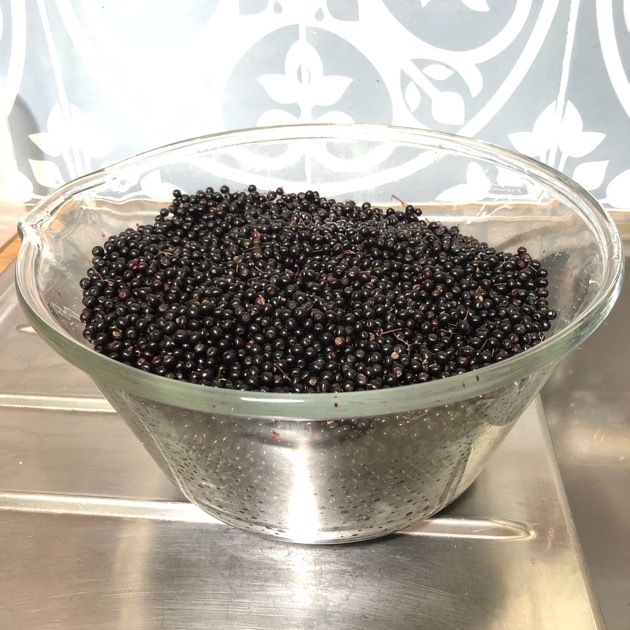 We harvested quite a few elderberries before the trees were pruned and, along with a bag of elderberries I'd frozen a few months ago, I made cordial for Kerry's family and us. And I have two litres of the processed juice in the freezer for later in the year. I'll probably make that into cold and flu tonic and another batch of cordial. The other preserving task was making dried apricot jam. It's too hot here for local apricot and when we get fresh apricots here in summer, they're usually quite expensive, hence the dried apricots. I used my one available Ball jar and the rest were recycled. I use recycled jars almost every day. A good collection of jars of every size is one of the best assets a home can have. Soak the apricots overnight and make the jam the following day. I used the recipe from the fabulous Food in Jars site and I'm happy to say the taste of this jam is complex and intensely apricot. I didn't use the vanilla in my batch because I wanted just the taste of the fruit, and that's what it delivered. We now have another five jars of jam in the stockpile cupboard and added to the strawberry jam Hanno made back in spring, we won't be making or buying jam until the end of the year. Today's loaf just out of the oven. Today I've got five minute bread in the oven that I started last night, it should be ready soon. The only other food prep I'll do today is to make our lunch of leftover roast chicken and potato salad and a green salad. It's an easy food day. My next major inside job is to clean up the room I'm in now. It's my "work room" which is where I have my computer, sewing machine, fabric and wool stash. It shouldn't take long to do. It just needs a good vacuum and tidy up which I'll probably get to tomorrow. So that's me, what are you doing? Looks like you been busy. Hi Rhonda, I just finished typing up the questions you sent us for your writing course, and emailed those to you with a link to an article. I planned to finish my Carbeth sweater today. I spent several hours on it, but there is still more to do. I have to sew in a few more ends, and graft the stitches together for underarm seam on the left side. It can wait until tomorrow. I will make a cauliflower cheese casserole and baked potatoes for dinner tonight. Your apricot jam and elderberry cordial look delicious! You are making me hungry! Everything looks pretty and delicious! oh how I miss air-conditioning! I can't wait until our generator is repaired and we can sit in the van in the air-conditioning and watch a movie on a Sunday afternoon. Today is a quiet one for me. After I dropped the boys off at school, I made some phone calls, did some writing and caught up on a little much needed rest this afternoon. Soon it will be time for school run and we might go for a dip in the river when Grant comes home. Dinner will be a simple tuna mornay style pasta. Great post as usual, thank you for inspiring me and so many others! I read the link to Food in Jars and have a question. Do you finish the dried apricot jam making process with the water bath, or just put the lids on and leave? I made all sorts of jams and chutneys from my excess produce when I lived in a cooler part of the planet - strawberry, raspberry, plum, rhubarb etc. I have never done any of them in the water bath and not had any problems but wonder if the heat and humidity we 'enjoy'in sunny QLD means I should follow this process? Sugar and boiling the jam help with the preservation. If you use sterile jars, they don't need a waterbath. Mine are in the cupboard. The picture of all those elderberries reminds me I must harvest mine soon. I spent the morning cleaning up fallen fruit in the orchard, then harvested about 5 kilos of pears, as well as lots of veg. I pulled black plastic off a 30 M square area where I am killing kikuyu grass permanently without chemicals. Now I just need to let the completely dead grass sit in 30 plus temperatures for a week or two and the dead runners can be removed and the area planted. I did another large area like this 18 months ago and the grass has never returned (but you need to have a deep trench/edge around the garden to ensure the existing lawn doesn't get in). When I came inside I made a corn and carrot miso soup (with my own veg) and a middle Eastern barley salad for dinner tonight, plus a few other things. I've cleaned up and have about 90 minutes to myself before my paid work starts! At least tonight's meal is ready to go. I'm keen to see your polystyrene planter boxes. I use these too and have converted them to wicking boxes (very easy too) and get bumper crops every time. your dried apricot jam and five minute bread look amazing. What a perfect combination-home made jam and crusty bread. Your dried apricot jam reminds me of my high school home economics class where I made dried apricot jam for the first time ever. We each took home a jar of jam. It was delicious. What a lovely memory you have triggered. I am definitely going to make some with the recipe from the site you have mentioned. 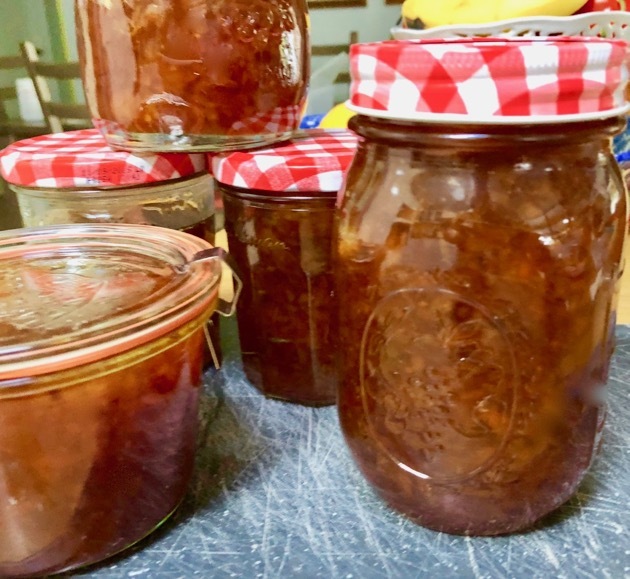 We are lucky to have a five year old apricot tree in our garden and although it only had a small crop this year I was able to make ten 300ml jars of jam. Five to give away and five for the pantry. I make your five minute bread often. Sometimes I follow your recipe to the letter but I have also adapted the recipe to use up some of my sourdough starter in place of the dried yeast and some of the water. At the moment I am dealing with a surplus of peaches, figs, plums and nectarines. I am stewing and freezing the fruit in portions just enough to use for baking or to eat with custard, ice cream or yoghurt. I have been making yoghurt since you posted about your electric yoghurt maker. I bought the Green Living Yoghurt maker and haven't looked back. I make yoghurt at least once a week. Thank you for all the time and effort you put into your blog Rhonda. I enjoy all your posts but love your food and recipe posts. You have had such a positive impact on my life and in turn my family's life. Our meals are all home made from scratch. I make bread, cakes, biscuits, muffins, bagels, flatbread and pita bread. I make jams and pickles and yoghurt. We have many fruit trees and grow as many herbs and vegetables as possible. I freeze or preserve whatever isn't eaten fresh. I apologise for the very long comment Rhonda but I think that I can say on behalf of your many readers that you are a truly wonderful role model. Thank you for sharing your knowledge and wonderful recipes and for encouraging us to live a simple and more meaningful life. 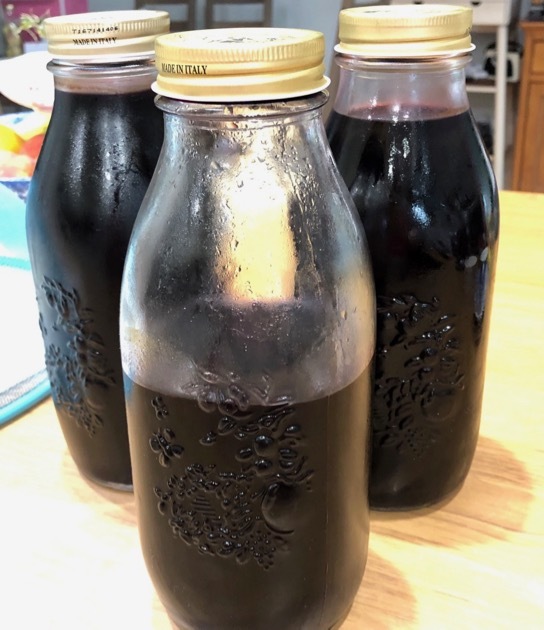 I made elderberry cordial once. I'm collecting berries to make a large batch next time. So impressed with your loaf of bread. A real Artisan loaf. A friend gave me a small bucket of Tamarillos the other day. He reckons once I've removed the skins I should have 3 lbs of fruit which is just enough for the recipe he gave me, that went with the fruit. He didn't need to tell me how old the recipe is (over 30 years) - as it's still in lbs. It's going to be so darn hot here in Brisbane today - and for the rest of the week, so I'm staying indoors today and turning this gifted fruit into delicious chutney. HI. Most of the time I'm just only a reader. But now I found your recipe!! That's a good idea. Can you imagine that we have a real bad cold time here now? Minus 42 yesterday and overnight almost there. Certainly will try your recipe!! Thank you and enjoy the nice weather! I wish we had some of the cold weather here, Wilma. I hope you like the bread. I work full-time and I am taking some classes as well so not as much time in the home. I create my to do list by the week rather than by the day. This week I am working to get some impatien seeds started for the window boxes come spring, I deep cleaned the refrigerator and the shower. 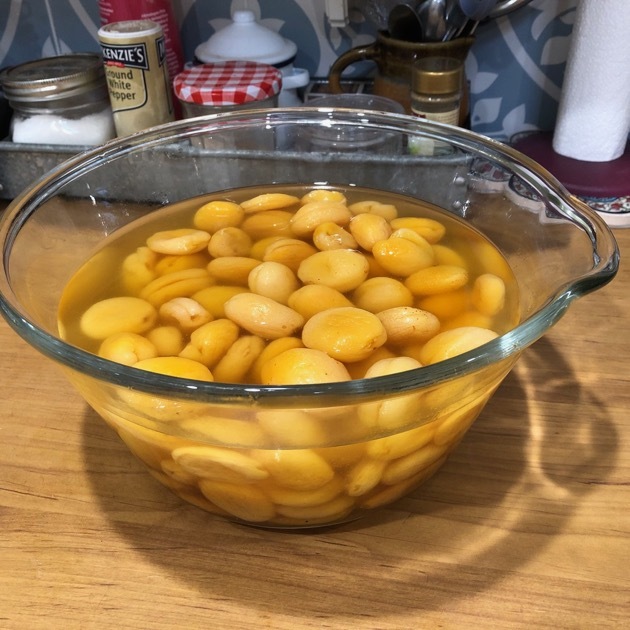 I will make some soup for the week and yesterday I made hummus with roasted garlic. I also got some mending done this last weekend. I am afraid that tomorrow I be spending quite a bit of time shoveling some snow but at least I will be working from home due to the expected winter storm coming through. It sounds like a busy home, Sara. Take care in the storm. Every day after work I'm preserving. Yesterday & today is oven roasted passata. Hoping to do zucchini pickles tomorrow, and grape jelly if I get to it. This time of year is rewarding but exhausting! That bread looks utterly delicious. 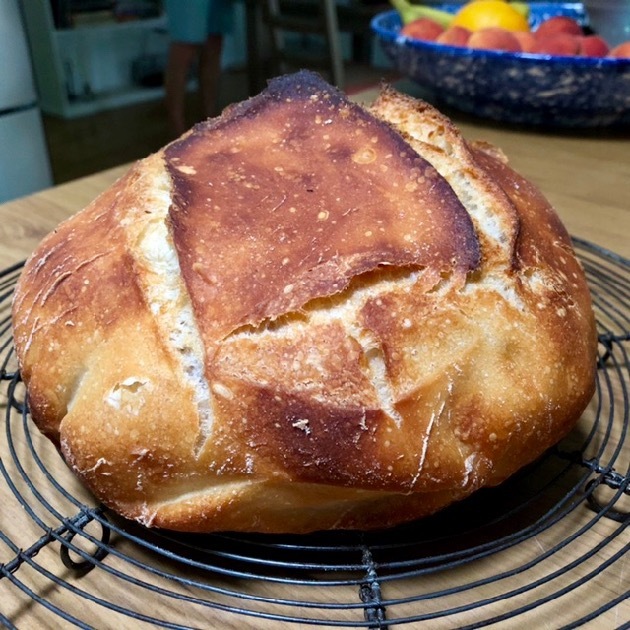 I have made bread to use for sandwiches and toast, but I've never made five-minute bread. Someday, I'll give it a try. My baking project for the weekend will be to make an apple pie. I have some soft apples that need to be used. your bread looks so yummy and so do your jams! i find it so funny to hear you talk about how hot it is and how cool to cold it is here in Tennessee. your dog is so cute too! 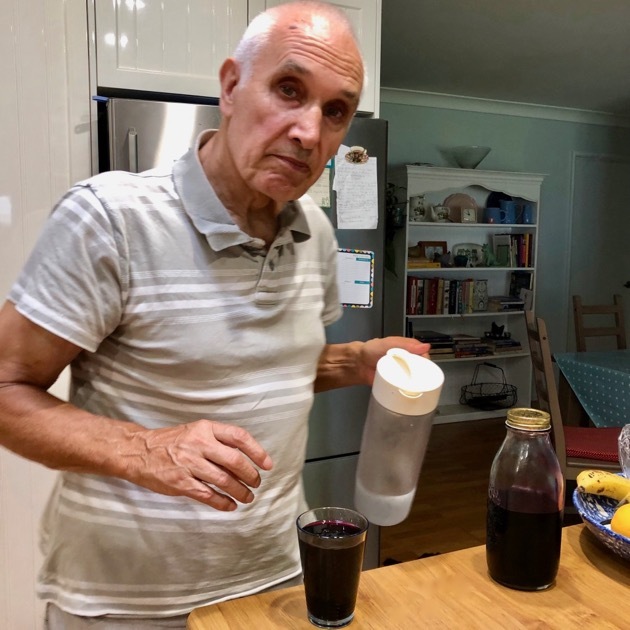 Have you ever used the left over whey from cheese making to make your own soft drink. I made the ginger cordial recipe from your book but felt I wanted it fizzy. (Kids are determined to ruin my old fashion ginger beer recipe with their wonderful help) Can I add whey from making ricotta to make it fizzy? Yes, adding whey will add lactobacillus and it should make a good fizzy drink. I do have a fizzy ginger beer recipe here too. I was super busy last week finishing off painting and gardening jobs for a garden party on Friday. It’s so lovely to have these tasks done. But now I need to get stuck into folding the washing and giving the cottage a good vacuum and dust. And there’s always gardening ... i need to pick our elderberries and make cordial too!